The study of the materials and structures that appear solid and reliable but can fail or move violently—including the ground under our feet and buildings—is of great interest to Engineering and Applied Science (EAS) professors José E. Andrade, Domniki Asimaki, and Nadia Lapusta. They develop sophisticated, data-intensive models to computationally investigate solid dynamics and understand how forces move both tiny particles and large-scale geologic formations within the earth. Some of these now-unpredictable movements are potentially catastrophic: earthquakes, for example, or soil liquefaction. Thus one goal of the solid dynamics effort is to create new computational tools that can accurately model and even forecast such movements. One critical application in this area is building safer structures and cities by better understanding and anticipating the types of potential motion and how artifacts and the ground they rest on will react to these motions. Another is making better concrete for various structures and in a more energy-efficient way. The research of Professors Andrade, Asimaki, and Lapusta focuses on multi-scale, multi-physics, nonlinear problems, and the challenge for all is how to translate their fundamental science into triumphs of engineering. Fundamental science does not generate satisfactory solutions to many important problems: too many variables and unknown parameters are in play. Yet empirical understanding is highly limited; in the case of earthquakes, for example, there have not been enough large events to develop a robust empirical understanding of their effects. How does one create the best engineering solutions given empirical knowledge and our developing fundamental understanding? “Addressing such engineering challenges to positively impact people’s lives is central to the purpose of engineering as a whole,” says Ares Rosakis, Theodore von Kármán Professor of Aeronautics and Professor of Mechanical Engineering. 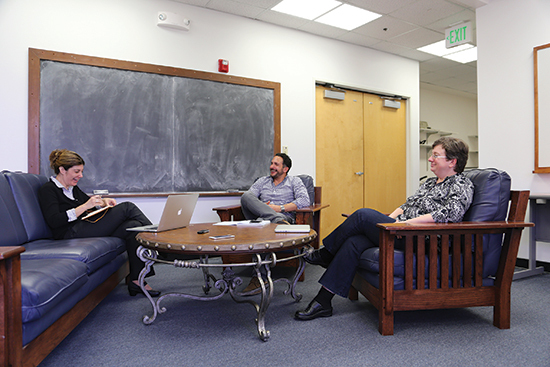 ENGenious sat down with the three faculty members to jointly discuss their work and the ties that link them. Nadia Lapusta, Professor of Mechanical Engineering and Geophysics, who has been at Caltech since 2002 after a start at the National University of Kiev and Harvard, focuses on the complex dynamics of solid interfaces and their friction properties, both within the earth’s interior and in the lab. She develops friction laws and computational tools to analyze how confined materials and their interfaces behave under stress, some failing suddenly and violently and others moving more gradually and less destructively. Domniki Asimaki, Professor of Mechanical and Civil Engineering, joined the EAS faculty last year, bringing from Athens and MIT a vision of understanding the reactions of surface features of the earth, ranging from hills and valleys to bridges and buildings, to the forces unleashed by subterranean players in the earth movement interactions analyzed by Lapusta. José E. Andrade, Professor of Civil and Mechanical Engineering, who has been at Caltech since 2010, has been studying the properties of ground itself, of heterogeneous mixtures natural and artificial. Many materials—sand is one familiar example—are assemblies of particles of various shapes and sizes and chemical compositions with empty space between them. These do not have the neatly predictable behaviors of pieces of metal or crystal, but their behavior has to be understood both for industrial processes and for analysis of the natural world. “I think it’s a difference in the philosophy between the way that we see things at Caltech and the way that usually the engineering world perceives things,” adds Andrade. “Our approach here at Caltech is more of an engineering science approach. As Nadia and Domniki explain, let’s find a solution that relies on fundamental science while explaining empirical ideas.” The three have succeeded in applying this approach to their different but related problems. Working on the smallest scale is Andrade, who explores granular particle mechanics (GEM) using an analytical path called the discrete element method. As an abstract of one of his recent papers explains, “It has been determined that lack of sphericity, sharper angularity and increased roughness all lead to increased mobilized strength in granular materials. For decades engineers have used very rough approximations of shape irregularities to make quite inaccurate predictions about behavior of such materials.” But Andrade’s group has found ways to statistically specify the various sizes and shapes of the disparate granules seen in high-resolution X-rays and other imaging technology. Their technique then allows them to use these detailed quantifications to predict precisely the properties to be expected in masses of granules. “GEM bypasses one of the current bottlenecks in computational discrete mechanics of granular materials by allowing discrete elements [of modeling] to take realistic and complex granular shapes encountered in engineering and science (e.g., sand grains),” says Andrade. “It is expected that, with the rapid advancement of computational power, combining high-fidelity characterization with physics-based computations will lead to more predictive modeling approaches. The granular element method may help transition from characterization to modeling and could lead to more realistic predictions at the grain scale.” Humans create and use huge amounts of granular materials. Concrete, a key example, is mixed by the gigaton yearly for construction projects from skyscrapers to backyard patios. A better understanding of particulate behavior, Andrade believes, may allow for the formulation of more precisely and optimally shaped concrete particles, which will mix more completely and efficiently and produce stronger walls and foundations—and do so in a more energy-efficient fashion. Asimaki is working to develop models that can improve the currently limited state of the art of evaluating vulnerabilities to phenomena such as liquefaction, landslides, and ground deformation, and also estimating the forces that these so-called earthquake effects impose on the buried and surficial infrastructure (e.g., pipelines, tunnels, and foundations) that can help to determine the risk of urban environments to earthquakes. A crucial element in achieving such physics-based assessment is the work being done in her colleague Professor Lapusta’s computer simulation laboratory. Lapusta’s methods probe the detailed underground dynamics of the stresses induced by tectonic motion and create models that reveal how the materials and their interfaces behave in response. Under the large compressive forces in the earth’s interior, failure of solids that produces earthquakes is localized to extremely narrow zones, less than a tenth of an inch wide. Inside such zones, the resistance to motion is determined by micro- and nano-sized particles. Lapusta’s group includes in its models insights into how such materials behave from various sources, including micro-modeling from Andrade’s group and Lapusta’s own micro- and continuum modeling of localized shear. The beginnings of this striking vision took the form of a graphic portrait of a segment of the San Andreas Fault, imaged from an array of instruments on the surface. A range of motion of the segment was reproduced in the simulation, from almost none in some parts of the fault to active slippage corresponding to the known movement—a stop-action movie of the earth in motion. Then Lapusta and colleagues modeled in detail earthquakes in Taiwan and Japan, trying to find the subterranean differences leading to massive, violent slips, as opposed to gentler, more gradual slides. In these studies, the researchers combined all known fault behaviors—earthquake nucleation, dynamic rupture, post-seismic slip, interseismic deformation, and patterns of large earthquakes—in a single dynamic model. The construction of such a model was facilitated by extensive collaborations and consultations across campus with a number of EAS and GPS (Geological and Planetary Sciences) faculty. One message that came out of this work has disturbing consequences for California: creeping segments can participate in large earthquakes, and hence much larger events than seismologists currently anticipate in many areas of the world are possible. That means, Lapusta says, that the seismic hazard in those areas need to be reevaluated—including around the San Andreas Fault. A creeping segment separates the southern and northern parts of California’s San Andreas Fault. Seismic hazard assessments assume that this segment would stop an earthquake from propagating from one part to the other, limiting the scope of a San Andreas quake. However, Lapusta’s models suggest that a much larger event may be possible than is now anticipated—one that might involve both the Los Angeles and San Francisco metropolitan areas. Lapusta and Asimaki say we still need to have a much deeper understanding of exactly what we have along our faults in California, both to make estimates of possible damage and perhaps—not tomorrow, but someday—to take action to create prophylactic miniquakes or slow slip to relieve accumulating stress, such as by manipulating fluid effects. But to do this, much better information is required. José Andrade is Professor of Civil and Mechanical Engineering. Domniki Asimaki is Professor of Mechanical and Civil Engineering. Nadia Lapusta is Professor of Mechanical Engineering and Geophysics.